Secure your laptop from theft at a minimum cost of investment with this easy to install kit. Multiple keying options make it the right choice for corporate, educational, and government agencies. Have specific security needs? Customize your kit. Guardian locks are the security solution trusted by top universities, fortune 500 corporations, and government agencies to keep valuable computers safe and secure. Guardian locks have been designed with improved pick resistance and more available key numbers. For increased security you have the choice to have your lock keyed-alike, keyed-different, master-keyed, and even request grand master-keyed at no upcharge. Use additional scissor clips or glue-on attachments with this kit to secure multiple items with one lock. Key numbers for the Guardian 810 series lock can be matched to other kits in this product line with different options and security levels. Manufacturing improvements allow for custom key options in a few days, not a few months. Guardian products are proudly built in the USA! We create products that offer the highest level of security 24 hours per day, 365 days per year. If you don't have a good anchor point, you can use this composite rectangular glue-on attachment on a frequently used desk (this is a permanent attachment). Can be used on plastic, wood or metal. Enough adhesive will be supplied to secure the number of attachments ordered. If you selected the Supervisor-Override Access (master-keyed) key option, your 1st order of 10 or more locks will come with 1 free Master Key You may order additional master keys here, but we do suggest limiting the number of people having complete access to your computer systems. 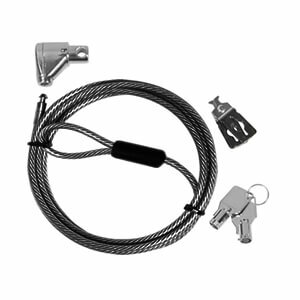 The economical design of the Guardian 810 style lock, combined with an external scissor clip, forms the equipment security point in our laptop cable lock system. This is the preferred choice when you need budget friendly security without a loss in quality. Our tough, durable 6’ steel security cable is strong enough to provide reliable protection but light and flexible enough to make it the perfect cable for laptop security. It’s made from 1⁄8” thick, heavy duty, aircraft cable and coated with vinyl for a 3⁄16” finished diameter. This economy version (E) is for lower risk areas, or where budget is the primary concern. The Scissor Clip is designed to fit into the existing security slot of your laptop. There are several keyed options for you to choose from, and each kit comes with 2 keys unless otherwise specified for the key option chosen. The key type you choose depends on access requirements and organizational needs. SUPERVISOR-ONLY ACCESS (keyed-alike): The same key can open all locks. Good choice if only a couple of people need access to the locks, such as a computer lab, or stationary desktops or laptops. SUPERVISOR-OVERRIDE ACCESS (master-keyed): Each lock can be opened by its own individual key, but there is one “master” key that opens all locks. Ideal for administrative or technical support access. 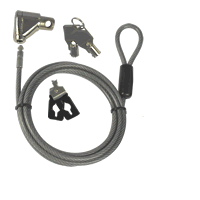 KA UNDER MASTER (KAMK): This combines the first two options above, allowing for multiple groups of KA locks under one Master key. INDIVIDUAL ACCESS (KD): Each lock is opened by its own unique key. Great for personal use or where mandated by security laws. SPECIAL (Grand Master, Reserved, etc): There are many combinations of the above options for larger organizations, such as separate Master Key systems for each campus and one Grand Master key to open them all. Have a question about key options? Call 1-800-466-7636 and we will guide you to the option that is right for you. Learn more about keying options here. Determining an anchor point for the security cable is a critical step to ensure your laptop is secure. The most common anchor points are through the data hole in a desk, around a table leg with a cross brace so it can’t be slipped off, or attached to a nearby immovable object. If these options are not available, you can use an accessory like a glue on attachment as a permanent anchor point. Security slots are generally located on the side or rear of most laptops. Once located, form an X shape with the scissor clip and insert the angled ends into the security slot. Then fold the clip flat to prepare it to receive the security cable. Once the scissor clip is properly inserted into the security slot, feed the end of the security cable through the clip's circular opening. The cable prevents the scissor clip from being removed from the security slot. Simply snap the lock onto the cable and your laptop is protected. To release the lock from the cable, insert the key and turn to the left. To learn more about Guardian locks, watch this helpful video.